Chicken is a versatile product. In every Russian family cooked the chicken according to your taste: fried, boiled, used for the preparation of zhuleny and salads. But there is one dish that is loved by all, as public holidays and on weekdays. And this is chickenbaked in the oven on a spit. Thoroughly wash eviscerated chicken carcass with cold water and place it on a thick paper towel to make the chicken a little dried out. In prepared bowl, squeeze the juice of half a lemon. Add to the lemon juice and olive oil. Mix. Crush the garlic with a knife or pass it through a special press. Add the chopped garlic in a bowl. Again, stir. Add in the mixture a small pinch of rosemary, Basil and thyme. Add salt and pepper. Again mix thoroughly with the marinade. Liberally coat the chicken with marinade. Leave the chicken to marinate in the refrigerator for 2-3 hours. When the chicken is marinated, put inside the carcass the remaining half of lemon. Solid white string tie the chicken wings and legs. Now attach the prepared carcass on a spit. Place the chicken in the oven, preheated to 220 degrees C. On the lower level of the oven put the pan, covered with a layer of foil to allow grease and excess juice. Bake the chicken at 180 degrees for 1 hour. 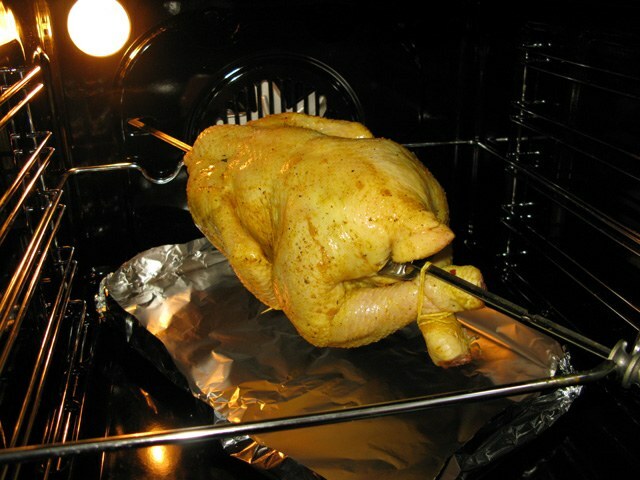 Check when the chicken is done, pierced with a fork or sharp knife chicken drumsticks. If the chicken is done, increase the heat to 220 degrees, and bake another 10 minutes until Golden brown. Remove the chicken from the spit, remove the bone, remove from carcasses of half a lemon. Put a delicious, fragrant chicken dish. Decorate the dish in its sole discretion. It can be your favorite garnish, herbs, sprigs of berries, fresh or baked vegetables. Be careful, checking the readiness of the chicken. Not in a hurry. If the perforation chicken leg flows a white juice, then chicken fried. And if to ooze blood, then the chicken to get up early, and you need to hold it in the oven for a little while. When choosing a shop, or market chicken, prefer steam, chilled bird. Don't buy frozen chicken. It may not be as tender and tasty as you expect.